TALAKAD - PANCHALINGA DARSHANA TALAKAD - PANCHALINGA DARSHANA - Shiva Maha Purana, Vishnu Purana, garuda purana, bhavishya purana, skanda purana. large congregation and festival take place. Talakad in Tirumakudalu Narsipur taluk is a town of great antiquity. Though a generation ago, it was a place out of reach of any visitor, in recent years, due to a bridge across river Cauvery near Sosale has made it possible for the visitors to have the beautiful prospect of seeing the place. This old city which was the proud capital of a bygone poweful kingdom is now rendered weird by wide expanse of sand dunes, burying beneath them more than a score of monuments of ancient glory. The site of the ancient capital was very extensive during the 12th century. The origin of the city is lost in antiquity. According to one tradition, the name is derived from two Kirata brothers, Tala and Kada, who discovered an idol of Vishnu, being worshipped by two elephants in the forest in this region, and the idol of Vishnu was installed in a shrine. Thus, the place got the name as ‘Talakadu’. The earliest authentic record mentions the name of the city as ‘Dalavanapura’ in the Ganga line of kings. Prince Harivarma, who reigned in 247 – 266 A.D., made this region his capital and subsequent kings of his dynasty followed. At the beginning of the 11th century, the Gangas succumbed to the Cholas, who captured Talakad and called it by a new name as Rajarajapura, which did not last for a long time. About a hundred years later, it was taken over by the Hoysala king Vishnuvardhana who drove the Cholas out of Mysore. Later, in 1634 A.D., Talakadu was conquered by the Rajahs of Mysore. An interesting local legend is prevalent regarding the formation of the sand dunes and the changing of the course of river Cauvery. According to it, Sriranga Raya also called as Tirumala Raya was the governor of the Vijayanagar family at Srirangapattana. As he was suffering from an incurable disease, he came to the temple of Vaidhyeshwara at Talakad to offer prayers, leaving his wife Rangamma also called as Alamelamma to look after the affairs of the state. When she came to know that Raja Wadeyar of Mysore dynasty was secretly planning to seize all the costly jewels of Alamelamma, she left Srirangapattana and came to Talakad and drowned herself along with all her jewels in the river Cauvery, pronouncing a curse on the Wadeyars and the town of Talakad. It is said that the river changed its course and wiped away the entire city burying it with sand. Even to this day, the Wadeyar family observe a ‘Suvasini Pooja’ during Navarathri in memory of Alamelamma. More than thirty temples, it is stated, are beneath the sand. The temples of Kirti Narayana is occasionally opened to allow access to visitors for certain ceremonies. Attempts are still being made by the Archaeological Department to excavate the entire area to ascertain the nature of monuments that have been buried under the sand. The town of Talakad is prospering, however, due to the rich wet cultivation in the neighbourhood. The ‘Pancha Lingas’ at Talakad are traditionally the temples of Vaidhyeshwara, Pathaleshwara, Maraleshwara, Arkeshwara and Mallikaijuna. Many other temples appear to have existed along with these five. Among these, the Vaikunta Narayana temple is no longer in existence, while the ancient Rajarajeshwara temple is buried deep in sand. In the recent years, Anandeshwara and Gaurishankara temples have been unearthed to some extent. The Kirthi Narayana temple is historically the most important. This is the only structure at Talakad which was built in Hoysala style. It is mostly buried in sand, only the top of the tower being visible. According to an inscription found at the temple, King Vishnuvardhana built this shrine in 1117 A.D. Tradition attributes to him in the creation of five idols of Narayana at different places, namely, Belur, Talakad, Melkote, Tondanur and Gundlupet. This temple at Talakad consists of a ‘garbhagriha’, a hall and a ‘navaranga’. The main deity of Kirthi Narayana is about two metres high, well carved and stands on a high pedestal. The usual attributes of Vishnu are held in the hands. The pillars of the Navaranga are well executed as all the jambs are ornamented with either scroll work or rows of animals or bead work. There are two niches at the sides of the inner entrance, one of them containing a standing figure of Viswaksena and the other being empty. The Vaidyeshwar temple stands about 250 metres to the east of first temple, very close to the sand dunes. It is the most elaborately carved temple in the whole of the neighbourhood and is constructed almost entirely of close grained granite. Although the Vaidhyeshwara Linga was existing during the Chola period, the temple itself appears to belong to a later period. It has several features of Hoysala style. There are only small porches. The south porch is a lovely piece of architecture. The two pillars of the porch are exquisitely carved. Sculptured idols are placed under the canopies in the front half of the temple. The idols of Mahishasuramardini, Brahma, Surya, Mohini, Lakshmi, Shiva and Saraswati are good specimens of art. The Devi temple is a Vijayanagar structure with a ‘sanctum’, sukhanasi and navaranga. Smaller shrine of Chandikeshwara is near the Parvathi shrine. The Pathaleshwara temple is an excavated pit about 100 metres to the south of Kirti Narayana temple. Though it is one of the Pancha Linga temples, it is comparatively small. The stone building relates to the 10th century while the tower and Nandi on the roof appear to be recent additions. The four navaranga pillars have a Chalukyan shape. The Linga in the ‘sanctum’ is small and reddish in colour. The Maraleshwara temple is also situated nearby. In many respects it resembles the Pathaleshwara temple. The round Navaranga pillars, the rounded basement cornice and the evidence of the Tamil inscriptions on its outer wall declare it to be a monument of the Chola or early Hoysala times. The basement of the ‘sanctum’ has cornices having small arches. Inside the Navaranga, there are, besides the fine round pillars, eight sided and sixteen sided or fluted pillars. Among the several idols sculptured in the hall, that of Madhava is beautiful and could be assigned to about the 14th century. There is a large Linga in the ‘sanctum’ whose very rough surface suggests a natural shape and origin from a very early date. 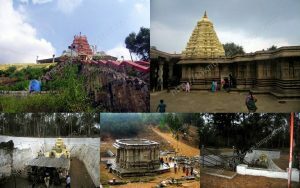 Arkeshwara is a temple located at a nearby village called Vijayapura. One of the Pancha Lingas, the temple being very close to the road, is visited by pilgrims during the Panchalinga festival. The original shrine appears to have been constructed during the Chola period, though the present structure is rebuilt recently. The two black stone pillars of the Chola period, have some inscriptions. The small Nandi in the sukhanasi is without any ornamentation. Mallikarjuna Linga is located in a temple on a small hillock near Talakad. A fair is held here annually which lasts for 15 days. A new hall called ‘Chitramandapa’ inside the enclosure of the temple has been recently constructed. It has on its walls paintings illustrating Girija Kalyana and other episodes from Shiva Purana. Gokarneshwara is a very small structure which is known only for its sacred pond called Gokarna Tirtha. Pilgrims use this tank for bathing purposes during the Pancha Linga Darshana time. On the whole, the antiquities of Talakad have a pathetic interest peculiar to themselves. Such of those who visit this place cannot but feel that they walk over the buried monuments of a city which prospered for over a thousand years as the seat of several dynasties of kings who ruled here. The pancha Linga Darshana is a great festival which occurs usually once in about twelve or fourteen years, when the new-moon Monday falls in the month of Karthika. It is considered meritorious and the place attracts thousands of pilgrims and visitors from all over the state and also the neighbouring places. A few months before the season, the sand dunes are removed with great labour to allow access for seeing the buried temples. Many temporary shops and resting places spring up during that time for the convenience of the visitors. A large fair is also held which lasts for more than a month. However, the performance of the visit and worship of the Pancha Lingas is not very easy as they are not in one place. Pilgrims have to walk considerable distances on the sand bed bearing all the difficulties of the weather and very inconvenient environment. Bangalore is the nearest air port for those coming from the north. Mysore city would be the ideal base for visiting Talakad. During the Pancha Linga Darshan season, frequent trips by bus are arranged by the Government Transport and private agencies from Mysore and Bangalore to Talakad. Taxies also can be hired from Mysore at reasonable rates. Talakad is 65 kms. from Mysore and 132 kms. from Bangalore. Mysore has very good hotels and lodging places.